Happy 1st day of spring! It may not quite feel like it here yet, but I'm excited for the season change. 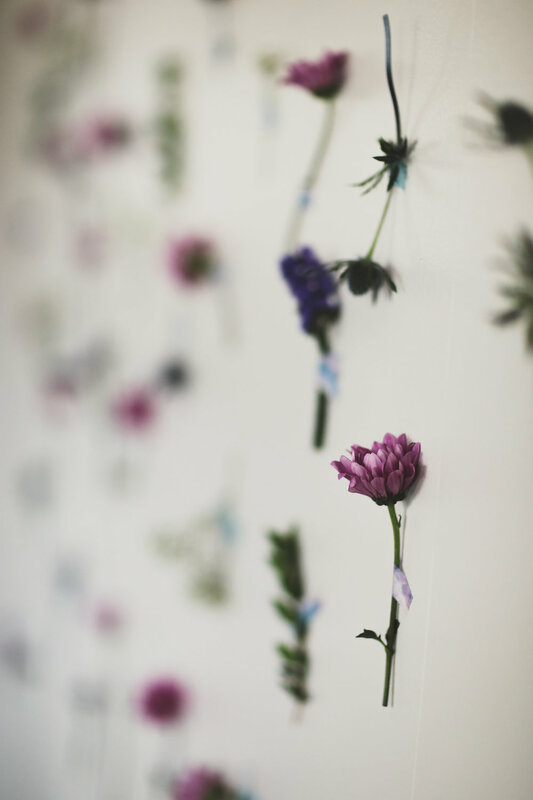 And with the first day of spring, I'd like to share this shoot that I recently styled. 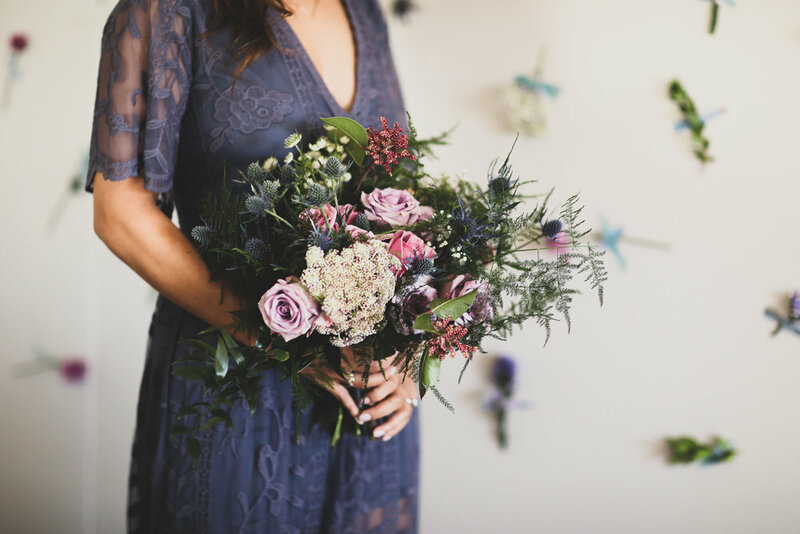 I met Emily of A Milly Sweets through one of my best friends, Michelle - both Emily and I are bridesmaids in Michelle's wedding, and we got to connecting about bridal/wedding styling and all things involving pretty table settings. Emily is a talented baker and was looking to organize a styled shoot to incorporate some of her cake creations. Emily got Michelle, Vivian (her hair and makeup artist friend) and I together with her over a happy hour sesh to talk over doing a fun, girly, tea party-like stylized shoot. Emily had shared that she really liked the idea of a "Marie Antoinette" style photoshoot, and we had to nail down exactly how we were going to execute the shoot. 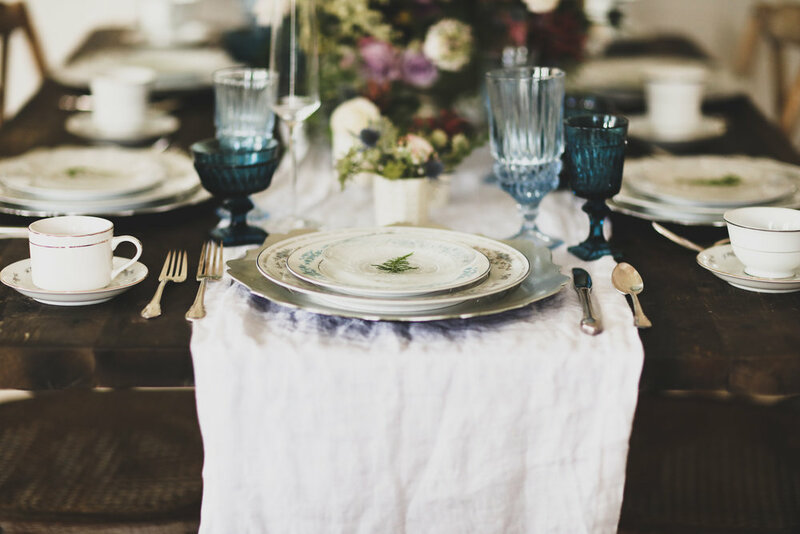 After Emily shared some inspiration photos, I pulled china and glassware from Birdie in a Barn (they just launched their website - check it out here) and brought Shawna (of course, are you surprised?) on to create floral arrangements and photograph. Originally, Emily was thinking of a lilac or teal and blue color story - since I wasn't able to get my hands on lilac or purple colored glassware, I decided to style two different shades of blue. I was really drawn to the deeper, almost denim blue color mixed with a baby blue shade of glassware. For tableware, I stacked depression clear glass plates on top of light blue floral china plates and scalloped metallic silver chargers. To give the tea party element to the table (without going too literal), I added white and silver accented tea cups. I balanced out the hints of metallic silver throughout the table by pairing a more antique silver finish for the flatware. Emily brought simple, champagne flutes and made rose gold champagne by adding lustre dust to the bubbly! Emily created three simple and chic fondant cakes. Each one, although subtle, has its own unique look whether with painted metallic gold detailing or marble finish - all three cakes enhanced the setting but also stood well on their own. Adding the floral touches was the perfect way to really tie the cakes into the theme. I originally had a sheer grey table runner to use, but I'm glad that Shawna had a white linen table runner on hand for me to style in because it really popped on the wooden farm table, helping to highlight the colored glassware and floral arrangements. Shawna arranged a statement floral centerpiece with light and dark shades of pinks and purples, then created smaller arrangements in white bone tea light holders sprinkled throughout the table runner. To tie in more of the floral aspect, flowers were added to Emily's cakes and I created a simple flower wall (flower stems taped onto the wall with watercolor printed washi tape - if you want to do this design on a wall in your room, use faux flowers), as well as tied long stemmed roses and greenery to twine that I draped above the mantle. I added a touch of green on top of each plate setting with a fern leaf. 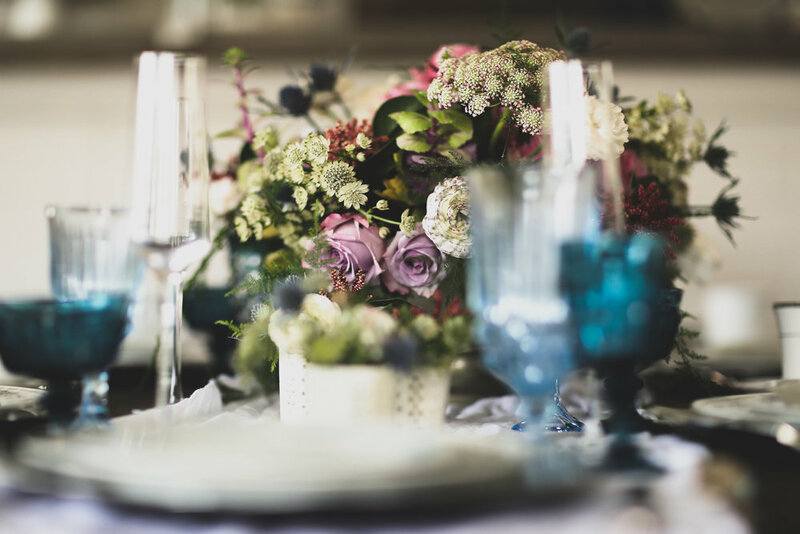 Other simple floral arrangements were placed on the mantle - a hydrangea in a vase, baby's breath and greenery in a milk jug bottle and a single rose in a vintage glass. Lastly, Emily, Michelle and I got dolled up by Vivian of Vivian Tran Artistry (she's an amazing hair and makeup artist, most revered in the bridal industry). She created soft hair looks, and gave us feminine with a touch of sultry and glam for the makeup looks. It just turned out that the shoot went into the direction of a dusty pink and lavender color theme from our wardrobe (we all brought dresses of our own) and reflective in the florals. Soft floral prints and fabrics like flowy chiffon and lace that we wore really complemented the setting and also added dimension and texture to the shoot. 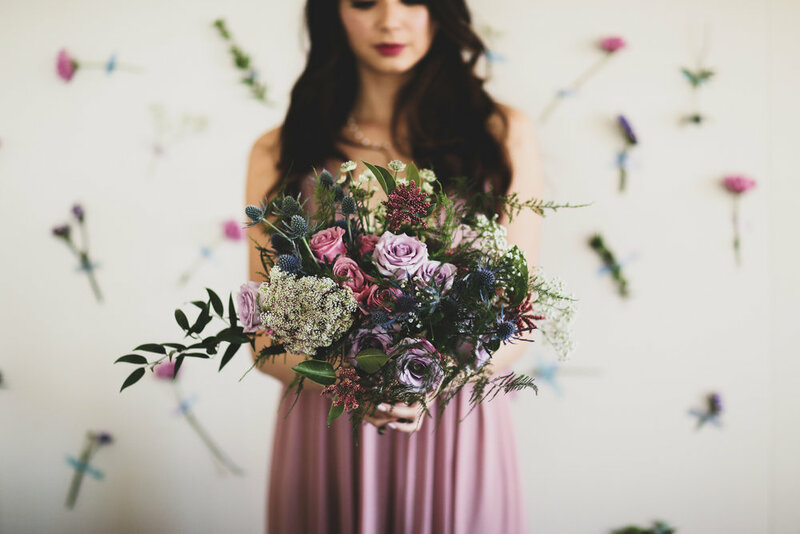 I hope this shoot inspires you if you are organizing or decorating an event this spring, or if you are looking for elements to use in a wedding or bridal related function (we seriously got some great bridesmaid looks here). 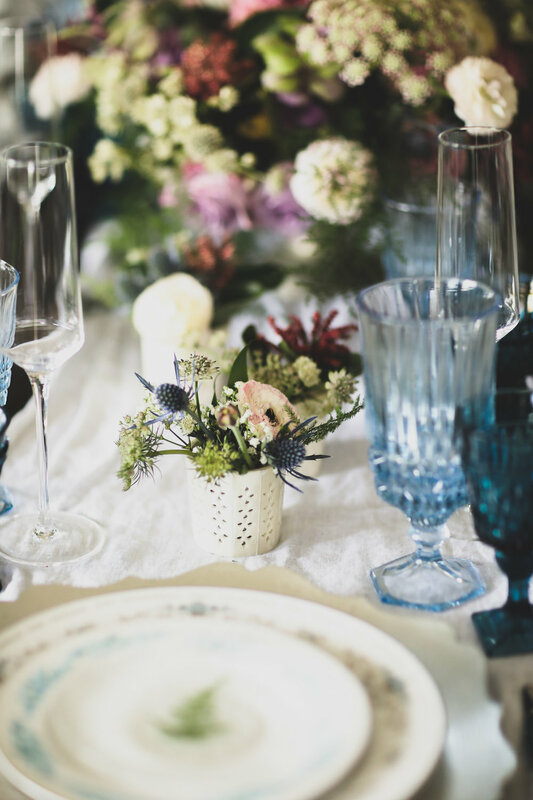 The styling and design elements from this shoot can be translated for a bridal shower, baby shower, birthday party or any gathering where you want to add a subdued yet impactful touch of spring and romanticism.